After 40 years in the business, Andrew’s inspiration is still seeing the look on the client’s face at the end of the project. Making people happy is the reward. In 1985, Andrew moved to California where he met his wife Jackie and established Gold Arts where together they help their clients fulfill their jewelry needs. Some come in with a specific idea, others with a special occasion, some with a simple repair that Andrew can often do while they wait. It is always their pleasure to help them, to see them happy, to take part in their celebration. The desire of the client to convey a message through a piece of jewelry is what he finds inspiring and motivating. It is encouraging to meet people that want to create that special connection by crafting such a treasured gift for their loved ones to enjoy. You will find Andrew and Jackie available by appointment to discuss your jewelry inspiration. Contact them at 949.422.7364. 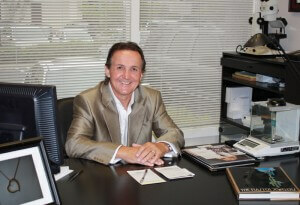 Serving Orange County Residents for Over 27 years CONTACT US TODAY!